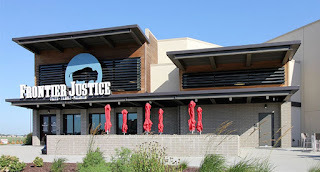 Frontier Justice is a premier firearms retailer that delivers unique faith-based, family-focused entertainment through a destination retail experience centered on the shooting sports. Fogel-Anderson Construction, a Kansas City based construction company, has started construction on the new two-story, 29,923 SF tilt-up facility designed by Slaggie Architects, Inc. The project is expected to be completed in early November in time for the holiday shopping season. The Legends is Kansas City’s premier outdoor shopping and entertainment center and the only designer outlet center in the market. The Frontier Justice project will add to the diverse and exciting tenant line-up that has characterized the Legends as one of Kansas City’s most popular shopping destinations. Frontier Justice is a premier firearms retailer that delivers a unique faith-based and family-focused entertainment and destination retail experience centered on the shooting sports and the authentic American Lifestyle. Their facilities offer a unique product mix of firearms and related accessories, archery equipment, art, clothing and jewelry. In addition to their retail offering, their unique facility includes a shooting range with multiple bays of varying lengths and a café. Their shooting range can be utilized by customers recreationally or for educational firearms training courses taught by their expert instructors. They serve as a premier shooting and shooting sports-related retail destination for the regional hunting, shooting sports, and law enforcement communities, as well as everyday American families. BRES is a full-service commercial real estate company managing over 38 million square feet of retail, office and industrial property, and nearly 7,500 units of multifamily property for equity partnerships and third party owners. BRES’s portfolio of services continues its role as the most comprehensive commercial real estate firm in Kansas City by providing and specializing in: real estate brokerage services, tenant representation, investment services, asset and property management, economic incentives consultation, financial services, construction and development services and the Block Funds.